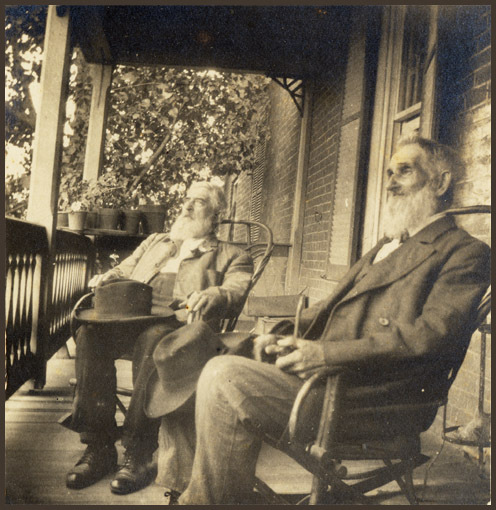 Comments: In this circa 1905 photo, Jonathan Pitts (left) sat with an old Civil War friend on the back porch of his Main Street home in Scottsville. When Virginia seceded from the Union on April 17, 1861, Jonathan enlisted as a private in the Scottsville Guard, a local militia unit. After drilling daily in Scottsville and later in Charlottesville, the Guard became Company C, 19th Virginia Infantry, and moved with the regiment to the fields of Northern Virginia. Jonathan was thirty-eight years old when he saw his first war action during the battle of First Manassas on July 21, 1861. Among his military duties were that of secretary of the commissary and ammunition. Jonathan was discharged on July 16, 1862, because his term of service had expired and he was over forty years of age. Jonathan Pitts died on December 28, 1920, after a three-day bout with influenza and is buried at Scottsville Baptist Church. This photograph is part of the Kathleen (Phillips) McNamara collection. Kathleen resides in Scottsville and is the great granddaughter of Jonathan A. Pitts.